Governor Andrew Cuomo | Major General Raymond F. Shields Jr.
HATTIESBURG, Miss -- Sgt. William King, of Buffalo, talks on a radio while training to perform airport security at the Hattiesburg Airport here March 12. King belongs to C Company, 27th Brigade Special Troops Battalion, which used the airport to learn airport security operations March 12 to 14. Airport security is one of several missions C Company may be performing when it deploys to Bahrain. The unit is part of the 27th Infantry Brigade Combat Team, and brigade Soldiers are at Camp Shelby, Mississippi preparing to go overseas. 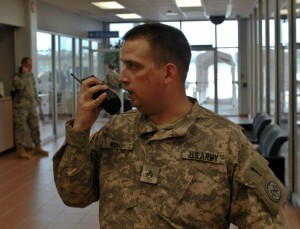 HATTIESBURG, Miss -- Some New York Army National Guard troops have shifted gears from communications to security in preparation for their upcoming deployment to Bahrain. Almost two dozen Soldiers of C Company, 27th Brigade Special Troops Battalion used the Hattiesburg - Laurel Regional Airport here to learn airport security operations March 12 to 14. The unit is part of the 27th Infantry Brigade Combat Team, and brigade Soldiers are at Camp Shelby, Mississippi preparing to go overseas. Airport security is one of several missions C Company may be performing in Bahrain, according to 2nd Lt. Matthew Carpenter, a platoon leader in the company and officer-in-charge of the airport training. The airport is the ideal place to learn how to work with airport personnel and learn their procedures, said Carpenter, of Hamburg, N.Y.
"The sole reason we’re here is get experience working at an airport," he said. "We can step back, watch how they do things, pick up a few pointers and work them into our standing operating procedures." Originally a signal company, the Soldiers learned how to provide security in the airport terminal and the airport perimeter, said Sgt. 1st Class David Colliton, of Florida, N.Y. They may be augmenting host-nation security in Bahrain, he added. "We have to get in the mindset that we’re a security force," he said. "I guess you could say we’re a back-up force." To do that, they had to learn how to back off, Colliton explained. In their initial exercises involving roleplayers, the Soldiers tended to be too aggressive, doing full vehicle searches, he added. By the second day they’d assimilated lessons from the previous day training, tailoring their actions to the lower threat level, learning how to assist the people they’ll encounter, while acting as extras eyes and ears for the police, Colliton explained. "We’re there simply supporting them," he explained. "A lot of it is going to be providing customer service." Their presence alone should deter trouble, said Pfc. Aaron Saint-Aude, of Westbury, N.Y.
"It’s definitely a shift in the mission," he said. He’s looking forward to seeing Bahrain and hopes to see some tourist attractions while off-duty, Saint-Aude said. "I like traveling," he said. "I’m curious to see what it’s like in the Middle East, culture-wise." The Soldiers are continuing to train here for their Bahrain missions. "Our heads are in the game, looking forward to going on the deployment," Carpenter said.